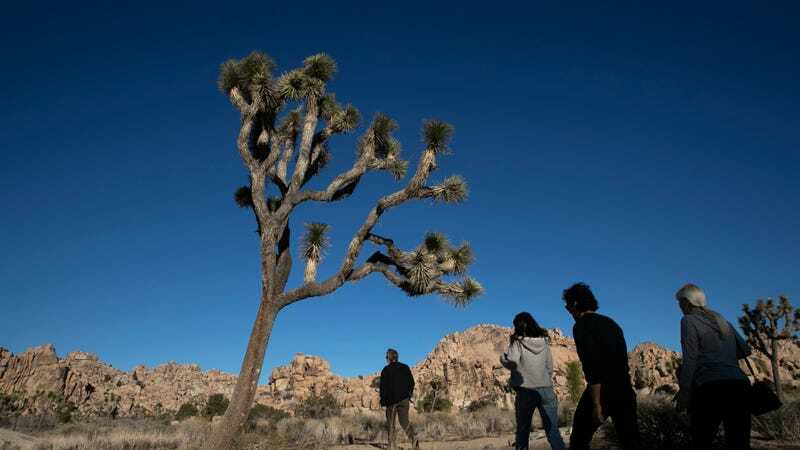 People visit Joshua Tree National Park in Southern California’s Mojave Desert, Thursday, Jan. 10, 2019. After President Donald Trump agreed to temporarily reopen the government, the National Park Service on Friday announced that some parks that remained closed during the 35-day shutdown would once again open to welcome visitors. The Associated Press reported that hundreds of parks will be “reopening on a rolling schedule,” with the National Park Service also noting not all will reopen right away. The Wright Brothers National Memorial and the Virgin Islands National Park were two parks that opened over the weekend, the Associated Press said, while Yellowstone National Park’s visitor centers were expected to reopen Sunday. As many of the nation’s treasured sites resume operations, others are bracing to tackle the lasting effects of the longest government shutdown in U.S. history. An estimated 16,000 National Park Service were furloughed, leaving many parks horribly understaffed and unable to manage visitors and campers.